Outstanding in the Field announced their 2011 season last week and tickets go on sale this coming Sunday. 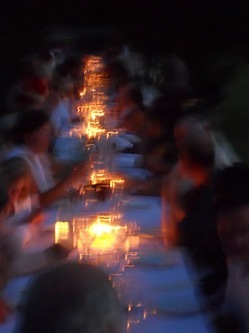 My 2010 best meal was at a 100 person long table, perfectly situated under two bent willow trees at Kinnikinnick Farm on a sunny warm evening in August. 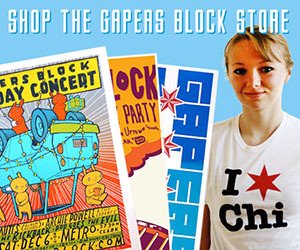 We made the trek up to Caledonia, Illinois, just 2.5 hours from Chicago smack in the middle of Lollapalooza as the haze from the Lady Gaga concert the night before wore off. After taking the road where the blacktop ended, just like in the country songs, we saw a big chalkboard with an arrow pointing right and took the turn. Parking in a grassy field next to a big red silo, we strolled over to the house where our fellow diners were sipping on Golden Jet (Goose Island/Publican brew) and a Summer Punch by the folks from Death's Door Spirits. 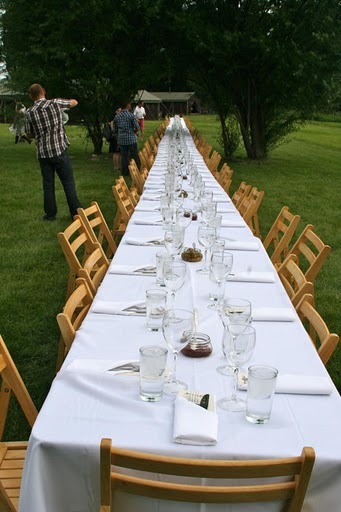 Outstanding in the Field (OITF) sets off in May on a grand tour of farm dinners across the US. As a guest, you receive a fine meal made from ingredients grown on the soil you're sitting on, composed by a local renowned chef, and paired with local drinks and favorite vineyards of the OITF staff. 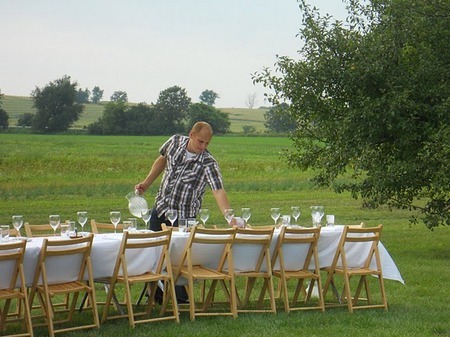 One gigantic table is set, guests bring their own plates and then mill about the farm learning about all that is grown and raised on it, while line cooks assemble the meal in a transient kitchen, housed in an empty barn. 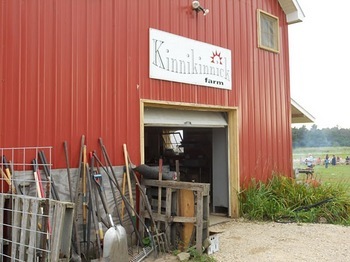 As I was touring Kinnikinnick with our futures trader-turned-farmer-in-retirement, Paul Kahan and his crew were slaving away. 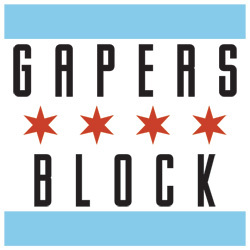 Tucked back in a cleared out barn, using makeshift countertops on sawhorses and a freshly built outside grill pit the folks from Blackbird, Publican and Big Star slaved away. 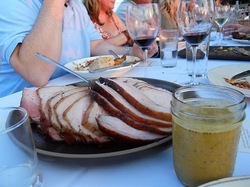 As dusk descended we took our seats and the farm fresh feast began. Served family style, plate after plate of biting fresh salads, appetizers and wine appeared on our table on and in our seemingly bottomless plates and cups. The meal started with a quinoa salad with rapini, Tropea onions, french beans and black mustard vinaigrette along with a simple tomato, feta and arugula salad. 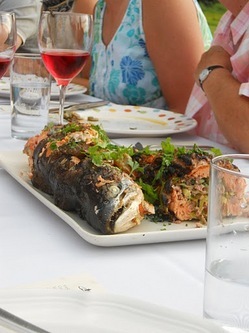 Next up, smoky grilled on the aforementioned grill pit, salmon stuffed with fennel-pernod sausage. Becker Lane Organic Farm provided us with the meats of the evening. 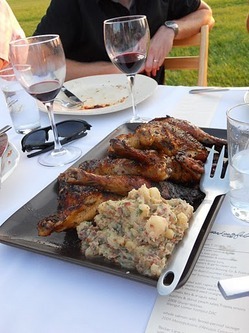 Pork shoulder and loin with mustard-barbecue sauce and grilled chicken with German potato salad, just like the homesteaders used to make. As the sun set, candles in ball jars were lit, and a peach-blueberry cobbler accompanied with sweet corn ice cream finished our evening. Kahan and his crew came out and gave a word or two of thanks to our hosts and let us applaud their fine cuisine. OITF is a fantastic opportunity to get your locavore fix in a pretty incredible way. The artistry of Jim Denevan's dedication to the perfect setting and careful pairings between farmer and chef are reflected beautifully as the evening unfolds. Check it out for yourself this year. Saw the email and immediately thought of you guys. I'll be holding down the farm in Wisconsin. for anyone who has peeps in oregon, hit the one in dundee... oregon wine country is absolutely beautiful. It is a great opportunity to have a fabulous dinner in an amazing setting and make new friends. Great article Jo!